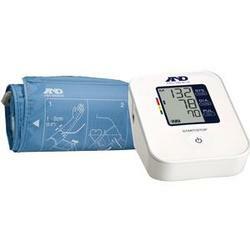 A&D Medical Life Source Basic Blood Pressure Monitor, 9-14, 6in. Basic blood pressure monitor is easy to use and comes standard with just the right number of features. 15-memory recall provides ample storage for home use or while traveling. Systolic, diastolic and pulse rate are all shown simultaneously for easy review. All the benefits of speed and accuracy are at the touch of a single button. Shows systolic diastolic and pulse rate. A latex- and metal-free cuff design.